Tinnitus (ringing or roaring in the ears) is a problem that affects millions of people in varying degrees. Research is being conducted to find the causes of tinnitus and develop more effective treatments. “Tinnitus Masking” hearing aids are now available that can help some patients by producing sounds that cover up the tinnitus. Recent research has shown that tinnitus often results from the brain’s attempt to overcome the auditory deprivation caused by hearing loss. In essence, the auditory areas of the brain turn up the volume “searching” for those missing signals, creating tinnitus. Approximately half the research subjects with tinnitus who were fitted with hearing aids experienced some relief from their symptoms. 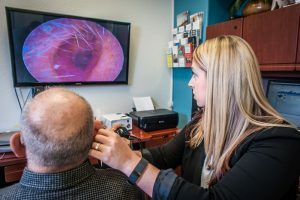 If a patient is found to have hearing loss, reintroducing the missing sounds to the auditory system seems to quiet the brain’s searching mechanism, giving differing levels of relief to each patient. For some the tinnitus is completely eliminated. For others there is a mild reduction while wearing the hearing aids. Biofeedback and new prescription drugs are being developed which may also provide relief. Other causes of tinnitus include various prescription drugs, high blood pressure and acoustic tumors. If you experience tinnitus you should first consult your primary care physician who can check your medications and blood pressure and look for other neurological abnormalities. After perusing and ruling out a medical diagnosis, a comprehensive audiological evaluation by a Doctor of Audiology is in order to determine the existence and degree of hearing loss. The Audiologist may recommend an appropriate hearing aid for a trial period to see if there is an improvement in the symptoms. For more information, see audiology.org.